Here we will promote your youtube videos by embedding in blogs posts , promoting in social media sources etc... and we are guaranteed minimum 50+ per day views for 30 days for just $6. we will not send bulk spam bot views unlike other sellers that will spoil your YouTube video ranking. Retention rate is one of the tools that used by YouTube to rank videos. Low retention view means that the viewer clicked on a video and left after a short while. This hurts the ranking of your video on the YouTube search engine and also it can be flagged by YouTube’s algorithms, leading to a drop in views. 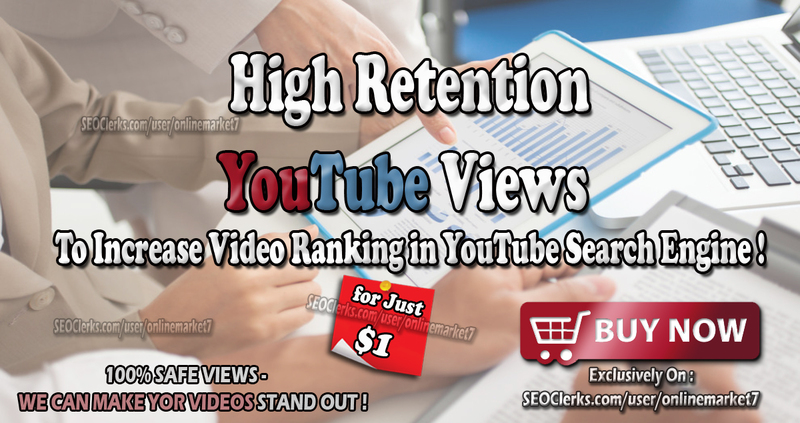 Always High Retention views will help to boost your YouTube video ranking. 100% MONEY BACK WARRANTED - If you are not satisfied with our service we will accept refund only within 5 days. You can change YouTube link anytime you want. But once you change we will send only remaining views for the new link (modification might take upto 1-2 days) - always its recommended not to change link and can provide only 1 YouTube video link per order. Instant start (we will start 99% of the orders within just 1 day) - But according to the youtube policies, the views might take upto 1 to 3 days to update in your Youtube video/dashboard. It depends in YouTube Terms of Service (TOS). YouTube TOS - Because of too many youtube restrictions like copyright violations of videos, photos, contents, links and much more we are not responsibility if videos gets deleted. also if your video breach youtube TOS like hacking tutorials, include spam links , KEYGEN, CRACKS, spam codes to generate points etc... that also will be the reasons to get videos deleted by youtube. So please make sure your YouTube fulfills all the Youtube TOS. Minimum guaranteed per day 50+ high retention views per day for 30 days for just $6. In most of the time all the orders will start within 24 hours and will deliver within 5 days and it will continue till reach all the targeted amount of days. Its recommended when you are having views from us not to work with other sellers. So you can track clean details and quality of our views. High Retention YouTube Traffic to Boost Video Views for 30 days is ranked 5 out of 5. Based on 160 user reviews.